by Carol Pierce Sold Out! Are you afraid to . . .
Make that major career move? Face those professional and personal changes you know must be taken?
. . . my friend Phil . . . read your book (Jump Now, Look Later) six times. Phil has throat cancer…His wife died of cancer…He has two sons…one is a state policeman . . . the other is a fire fighter . . . Phil is not the type to brag about anything . . . Phil is tough love. Very serious . . . I was shocked! I could not believe this was the Philip that I know so well. I told him that I would read the book and return it as soon as I could . . . He told me not to bring it back until I read it three or four times. I read it once, so far . . .
Phil is tough love. I better listen! How can you, your business, or your organization overcome these fears blocking your path to success? Order this quick, easy-to-read book today to discover the 8 Jump Now steps which allow internationally known entrepreneur / success strategist Carol Pierce, her clients, and all who apply these steps to now have such a better personal life and more successful businesses. Discover how to turn negative situations in your life, in your business, or in your organization into more pleasant, more productive, more successful ones. Do like Pershing Wells . . . let Jump Now help you find out what you really want, how badly you want it, and how you can apply the 8 steps to get it! Marianne Frederick, CEO, WorkPlay, Inc.
How badly do you want to overcome those fears paralyzing and preventing you, your company, or your organization from achieving the success you really deserve? Using actual, real-life experiences, Jump Now reveals how Carol Pierce and twelve other everyday people surmount these and many other fears that continued to appear in their lives. Learn how you can do like them . . . gain the confidence and the courage to conquer those fears and those false beliefs preventing you, your company, or your organization from achieving whatever you really want. See what readers are saying about Jump Now. 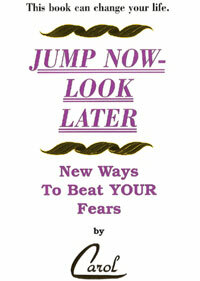 Jump Now, Look Later: New Ways to Beat YOUR Fears - ISBN: 0-9662717-0-X -- Book -- Sold out! Do you have an idea for a book you have started and never finished? Would you like to finally publish that book, but you are not sure what way to go to get it published? Wanna Self-Publish can take you from where you are in the creation process and guide you through the publishing and marketing of your book. Discover simple strategies you can start implementing as you browse through this short, easy-to-follow reference tool. Find out the real facts about publishing that so few realize. Learn the do's and don'ts to creating a top-quality book. Discover the many valuable resources available to help you become a publishing success. This practical handbook is a must for anyone considering self-publishing. 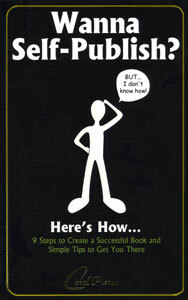 Do I REALLY Want to Self-Publish? How Do I Develop a Well Written Manuscript? What Creates an Effective Title? What Parts Must Be Included in My Book? Who Needs to Be on My Publishing Team? How Do I Entice People to Buy My Book (and Read It)? "Are there changes you would like to implement in your department or your organization? Are you considering switching careers to pursue your true passion? Are you contemplating beginning your own business? What do you want to accomplish? Why don't you have it yet? Why are you procrastinating?" 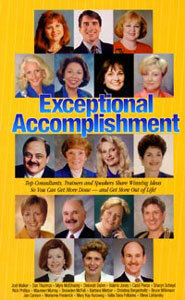 asks Carol Pierce in Exceptional Accomplishments. Is procrastination really bad? Discover why Success Strategist Carol Pierce says it is not . . . that procrastination can actually help you become even more successful even quicker! Learn how to break those false beliefs about procrastination that hamper your success. Discover those proven strategies that Carol Pierce, along with seventeen other top consultants, trainers, and speakers from across the United States, share to help you jump now get more of the successes you really want. As you apply these practical ideas, they will help simplify your life and allow you to accomplish more with less frustration. Is Jump Now, Look Later really worth reading????? Tom Peters, Business Leadership Guru, author of The Circle of Innovation and The Pursuit of WOW! “If I had not read (Jump Now) I would not have had the vision and self-confidence to go after my dreams . . . to have a successful bed and breakfast business, to be a successful published author and to retire from teaching by the age of 50 (five years from now). “After reading Carol's book I realized that I was just like the people she had written about before they started thinking positively. I, too, had been thinking of all the reasons I couldn't do what I wanted to do instead of coming up with ways I could. I, too, was afraid of failure and of disappointing certain people in my life. I, too, lacked self-confidence and thought negatively instead of positively. I, too, felt my job had become a dreaded place I had to be at instead of a fulfilling career. The morning after reading "Jump Now, Look Later" I woke up with fresh ideas of how I could achieve all three of my dreams and each one would play a part in the accomplishment of the other. Pam Villagran, author of Why Was I Born Last?